This is a wonderful book of raw architecture ideas and plans submitted some of the best architects around. The examples are all unrealised designs, many submitted for proposals but were rejected for various reasons. They are now collected in this thick 400-page hardcover. The examples are wide ranging, covering seven main areas, namely arts and entertainment, accommodation, master plans, museums, bridges and towers, culture and education and finally work and travel. Some of the designs are very bold, like the first example for Arabian Performance Venue which looks like building on stilts with gold tentacles coming from the water beneath. Some are quite futuristic, some industrial, and most feel like pieces of modern contemporary art. It's a refreshing and inspiring architecture idea book. Recommended to architects and designers looking for something less conventional. What happens to the projects that are produced for international competitions when they don’t win? Or the grand plans for which hundreds of thousands of dollars or euros are spent in research and development but which are never built? Or the proposals for speculative builders who can’t, in the end, raise the money? Or the buildings commissioned by governments which are too visionary to be constructed? A single image might appear in professional journals, but most of the plans will disappear, never to be seen again. 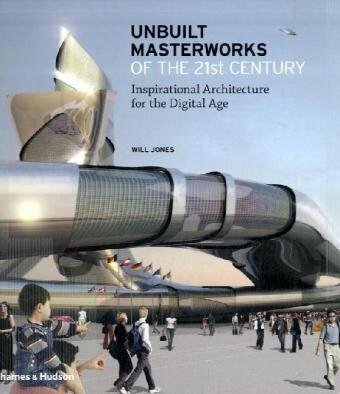 This book features one hundred of the best unbuilt projects proposed since the turn of the millennium by some of the world’s greatest contemporary architects, including Norman Foster, Rem Koolhaas/OMA, Foreign Office Architects, Diller Scofidio + Renfro, and Zaha Hadid, as well as rising stars such as Jürgen Mayer H Architects and Asymptote. Arranged in sections according to function—entertainment spaces, museums, urban plans, education, habitation—the projects are presented in detail through texts that consider the importance of the designs and assess why they weren’t built, along with renderings and plans. Many of the more than 600 illustrations have not been seen outside the practices themselves. 747 color, 153 b&w illustrations. This book looks amazing. I'm definetly considering getting this as I'm developing an appreciation for architecture concept art from a couple of book reviews you've been posting Parka. Are there any more books like this you can recommend? I don't read these books often so I can't help. You can try looking at architecture blogs.